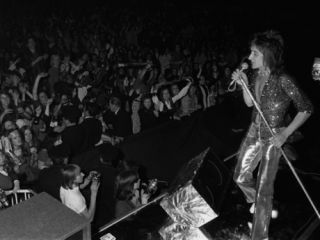 Rod Stewart performing with The Faces in 1972. Rod Stewart is to perform live with The Faces for the first time in 19 years, drummer Kenney Jones has exclusively revealed to MusicRadar. The band will play a short set when they are inducted into the Rock And Roll Hall Of Fame in Cleveland, Ohio, on 14 April. It will be the first time the surviving members of the group (Stewart, Jones, guitarist Ron Wood and keyboard player Ian McLagan) have played together in public since Stewart received a lifetime achievement honour at the Brit Awards in 1993. Recent Faces reunions have seen Mick Hucknall singing the band's legendary hits. "Contrary to what some people might think, we're all still great mates and we've never said we wouldn't play together again," said Jones. "We all had dinner about a month ago and decided that the Rock And Roll Hall Of Fame would be the perfect time and place. "The last time we rehearsed together was about three years ago at a little place in Bermondsey, the same place where we used to rehearse back in the '70s, just to see if the magic was still there - and it was. We ended up not doing anything more for a couple of reasons, including Rod's busy solo schedule and his Vegas commitments, which is why we brought in Mick for a few dates." Speaking to MusicRadar last year, McLagan went into more detail as to why those rehearsals came to nought: "The thing is that Rod's voice isn't what it was, he had surgery on his vocal cords a few years ago and it's changed the way he sings. "We basically had to re-learn all the songs in different keys to accommodate Rod. Ron Wood had to put heavier strings on his guitar and tune everything down, and we all agreed that it just wasn't the same. That's not to say we'll never play with Rod again, never say never; if at some point in the future he's really up for it, and we can all get comfortable with the changes to the songs, there's no reason for us not to get back out there." Jones wouldn't reveal the specific contents of the group's three-song set at the induction, but said it would comprise two Faces tracks and an earlier hit by The Small Faces, who are also being inducted. "As to whether we'll do anything else after the Hall Of Fame show, we'll just have to see how it goes," Jones added. "I'd like to think there's more to come, although it depends how everyone's individual schedules are shaping up. But we're all really looking forward to getting up on stage again, it's been far too long."